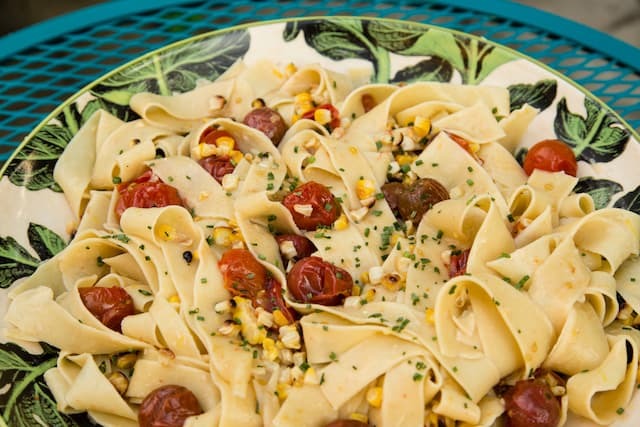 Summer Corn and Tomato Pasta | Good. Food. Stories. What is it about al fresco meals that makes us compelled to fire up the grill? I can’t be the only one who feels this way. If I have friends coming over for dinner when the weather’s nice, I want to make the most of our little backyard oasis. I want us to savor the breezes, toast s’mores in the firepit, and if the grill’s right there with us, I feel like we should be using it. The thing is, I hate grilling a la minute when we have guests. I’m constantly checking, hovering, poking, flipping, and doing all the work instead of enjoying myself and the company of the friends who trekked all the way out to see us. So my advice to people who don’t want to grill for their guests? Just don’t. Rather, do it ahead of time so you can kick back and have a relaxing evening with everyone else. My strategy for getting over the grill guilt is the same one I employ when I’m having indoor dinner parties: pick a menu that lets you get the bulk of the prep done ahead of time. As much as I’m skilled at doing cooking classes and demos, that’s never how I want to spend my evenings. So I’m the queen of serving stuff that’s finishing up in the oven when they arrived, or that I’ve cooked earlier in the day and that only needs a quick finish. Pot pies, roasted vegetables, big salads topped with steak or shrimp; all of these are simple meals that don’t have to be finished while your friends are waiting. You can do the same in the summer. Unless you’ve specifically invited people over for burgers, don’t make them—there’s so much else that can be be grilled earlier and gives you that smoky essence without forcing you to sweat and toil in the middle of the party. Pre-grill your pizza dough and let it rest at room temperature, topping and finishing off each pie when everyone’s ready. Do a beer can chicken, which tastes just as good pulled apart and served over greens and vegetables as it does whole. Grill your lemons for bourbon peach lemonade. Or grill vegetables ahead of time, then toss and serve with fresh pasta (purchased or homemade) for a killer dish that’s easier than almost anything else you can throw together. Apart from boiling water and tossing the ingredients together at the last minute, this meal gets all the work out of the way earlier in the day—and it can be mixed and matched with whatever looks best at the market that morning. Corn and tomatoes are always a safe summer bet in my book. Their sweet-tart matchup is only enhanced by a quick stint on the grill, and when tossed with a lemony roasted garlic creme fraiche, you get a meal that feels luxurious but not heavy and overwhelming. If you’re making pasta from scratch, quadruple the dough ratio in my foolproof pasta dough recipe and you’ll have more than enough to feed everyone. 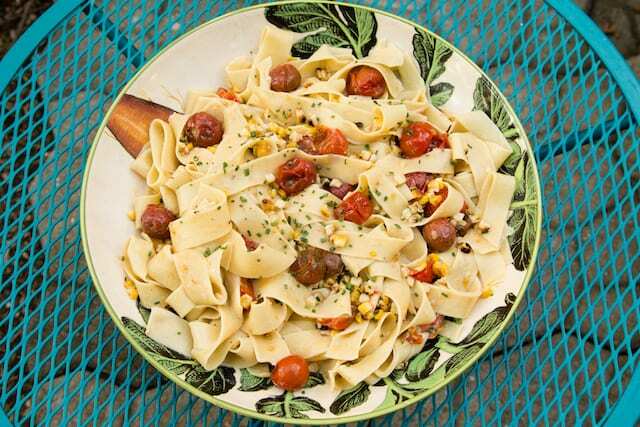 Slice as thick or as thin as you want; I love the wide strands of tagliatelle or pappardelle for nestling the sweet tomatoes and corn in this recipe, but do what you’re feeling. Tear off a long sheet of aluminum foil and double layer it over itself. Slice the top 1/2 inch off the head of garlic, then place in the center of the foil sheets. Drizzle with olive oil and sprinkle with salt. Seal the foil around the garlic. Preheat your grill for medium direct heat, placing the garlic on the grill as it preheats so it begins to roast. Once the grill is hot (about 450-500 degrees F), place the corn directly on the grates. Cook, turning as needed, until most of the kernels are toasty and charred. 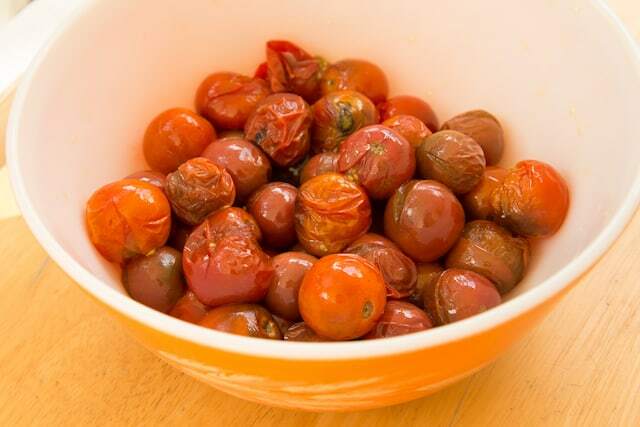 Toss the tomatoes with a splash of olive oil and a pinch of salt. Cook in a grill basket for just a few minutes, until the skins take on some grill color and start to split. Remove the tomatoes from the grill and reserve at room temperature. By the time the corn is charred, the garlic should be very soft—it will let you know that it’s done by smelling gloriously roasted. Let both the corn and garlic cool until you can handle them without burning your fingers. Turn the grill off—your work there is done! Squeeze the roasted garlic cloves out of the skins into a bowl and smash the cloves into a paste with a fork. Add the creme fraiche, lemon zest, and a pinch of salt, and stir to combine. Refrigerate until ready to serve the pasta. Slice the charred corn kernels off the cob into your pasta serving bowl. About an hour before you’re ready to serve the pasta, mince the chives and add to the serving bowl. Fill a large (8-quart) pot with water so it’s ready to be heated. Bring the pasta water to a boil and add a heaping tablespoon kosher salt. Cook the pasta just until tender—for fresh pasta, this will only take a few minutes. Drain the pasta, reserving a few tablespoons cooking water, or use tongs to transfer the dripping strands to your serving bowl. Add the reserved roasted garlic creme fraiche and toss the pasta until all the ingredients are evenly coated. Add the reserved cooking water if necessary. Taste and add salt, if needed. Garnish with freshly ground black pepper and serve immediately.